Last night, AMC aired the much-anticipated season one finale of their critically acclaimed zombie-fest, The Walking Dead. This show has literally captivated millions of viewers, breaking all kinds of cable TV ratings in the process. I'd like to talk a bit about the show, and the comic, so please be warned--there are SPOILERS AHEAD, and there will be throughout this post, so if you haven't yet watched all six episodes and/or read through the first trade collection of the comic, now's your chance to jump ship. Well, actually, these next few lines of dashes are your last chance. But after the dashes...it's your own fault if something gets spoiled. I can't believe everyone died!!! Sorry. Just wanted to completely freak out anyone who may have wandered past my system of dashes. I've heard two main criticisms of AMC's adaptation--first, it's too different from the comic. And second, it's too similar to the comic. Ah, fandom, how I love your crazy, contradictory attitudes towards everything on the planet. Whenever a story is taken from one medium and transferred to another, it's inevitable that someone's favorite bits will be left out, while someone else's least favorite bits will be kept in. And made a recurring theme. Or something. But in the case of Walking Dead, I truly feel that the TV folks are keeping the series very much in the same vein as the comic book. It's a dark, bleak show--hopeless, at times--and that comes directly from writer Robert Kirkman's comic scripts. Aside from episode two's weird, rock n' roll playing, cool car driving ending, there hasn't been a hint of levity in the series. And, as readers of the comic know, any time something (just a little bit) good happens, brace for impact, because things are about to get very, very bad. Like in last night's episode. A drunken, happy, relieved Rick? Yep. You just knew the zombies were gonna mess that up. Or, you know, the building was going to self destruct and kill everyone inside. Personally, I wasn't thrilled with the introduction of the CDC, and the whole government facility in general when it was introduced last week. However, last night's finale sold me on it as a solid--and sensible--plot point. The group is in Atlanta, the actual CDC is in Atlanta--it makes sense that they'd at least try getting to the building. We also saw a much darker turn for the Shane character--something that's very much necessary if Shane's fate in the TV series is to match his fate in the comic series. 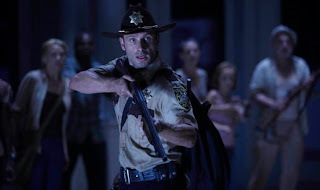 He's a man on the brink, and for the first time, we see that he's a real, live threat to Rick and his family. Episode six leaves our group at a perfect place from which to start season two--it's more or less a clean slate, with a couple of dangling, and interesting, plot points. Besides the major Shane-Rick feud that's brewing, we have Michael Rooker's Merle character--who is not featured in the comic--as a looming, ever-present threat to everyone on the show. And, of course, there are all those pesky zombies out there. Season one was a huge success--both financially for AMC and critically for the creators--and I cannot wait for season two. I'm interested in everyone else's thoughts, though, so please chime in!